The strategic document was presented to the Board members by the RCC Secretary General, Hido Biscevic, who highlighted the main course of action for the organization in the upcoming period. "I am very happy that the Board has given its full support to the RCC roadmap in our priority areas of economic and social development, energy and infrastructure, justice and home affairs, security cooperation, building human capital, and parliamentary cooperation", said Biscevic. "Our mission will be to promote mutual cooperation and European and Euro-Atlantic integration of South Eastern Europe in order to reinvigorate economic and social development in the region to the benefit of the citizens, as they strongly voice their wish to get closer to the European and Euro-Atlantic institutions." Ms. Jelica Minic will head the Expert Pool. She will also carry out the function of the Deputy Secretary General. Mr. Miroslav Papa, Chief of Staff, will head the Front Office. Ms. Emira Tufo will be the Head of Economic and Social Development Unit. Mr. Miroslav Kukobat will be the Head of Infrastructure and Energy Unit. Mr. Virgil Constantin Ivan-Cucu will be the Head of Justice and Home Affairs Unit. 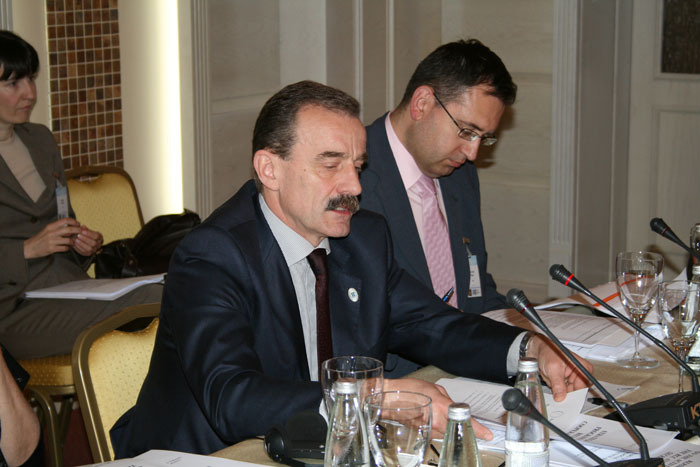 Mr. Efrem Radev will be the Head of the Security Issues Unit. Mr. Alexandru Murzac will be the Head of Administration. Ms. Dinka Zivalj will be the Spokesperson and will head the Media Unit. Mr. Stanislav Daskalov will head the Liaison Office. Mr. Basil Coronakis will be the Deputy Head of Liaison Office. The Secretary General has appointed Mr. Jovan Tegovski to the post of Special Envoy of the RCC Secretary General for Relations with the Presidency of the EU Council. The RCC Board meets quarterly. Its next meeting will be held in September 2008 in Sarajevo, Bosnia and Herzegovina. The Board provides operational guidance and supervision to the RCC. It comprises of those RCC members contributing to the budget of the RCC Secretariat as well as the EU, represented by the Troika consisting of the EU Presidency, the European Commission and the European Council Secretariat. The Concept Paper on regional ownership is available at www.rcc.int, while the full text of the 2008-2009 RCC Strategic Work Programme will be posted on the RCC website tomorrow, following the approval by the SEECP Heads of State and Government.